New ARTdornments + Giveaway and Freebies! Five new ARTdornments necklaces are on auction, ending on Wednesday. They include: lovely lady playing a mandolin, beaded with gorgeous red, gold and green glass beads, an antiqued gold poppy pendant on a black and red beaded necklace, a striking Eclectus Pair set with green beads, a unique horse medallion pendant, and a lovely beaded set featuring a pair of Congo African Grey Parrots. I'm offering another Giveaway this month! The prize is this pretty horse medallion necklace in antiqued silver, from my ARTdornments line. Enter to win here. You can earn extra entries by "Liking" my Facebook pages: ARTdornments on Facebook, Alicia's Creations on Facebook page, , and Joy Magnet Art on Facebook, or by following my Twitter accounts as well, but these are not mandatory. The giveaway is open to residents of the USA, age 18 and older, and ends on January 4. Good luck! To show my appreciation for your business this month, everyone who purchases something from my eBay auctions will receive a free gift! 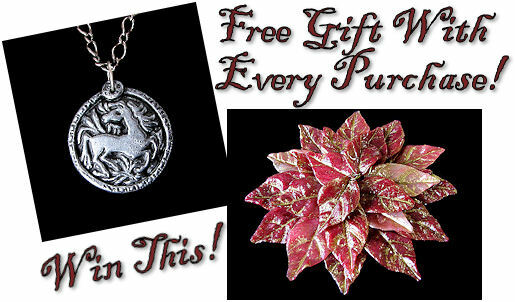 I created several dozen beautiful "poinsettia petal" pendants, and look forward to sharing them with you! I piled them all up together for this photo, each "petal" is a separate pendant! May you be blessed with peace, love and joy this holiday season, and enjoy an abundance of all good things in the coming New Year! 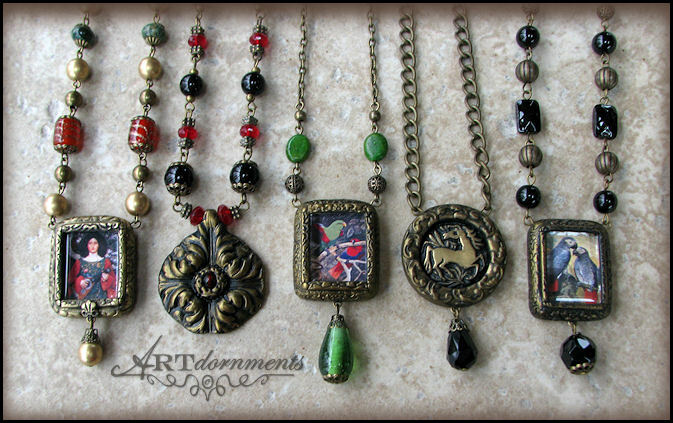 New ARTdornments Jewelry on eBay! Four new ARTdornments necklaces are on auction, ending on Friday. They include a pendant featuring a pair of Aracaris, a pretty beaded Ballerina, a striking Medallion, and a beaded Head of a Woman by Da Vinci. I so love making these! 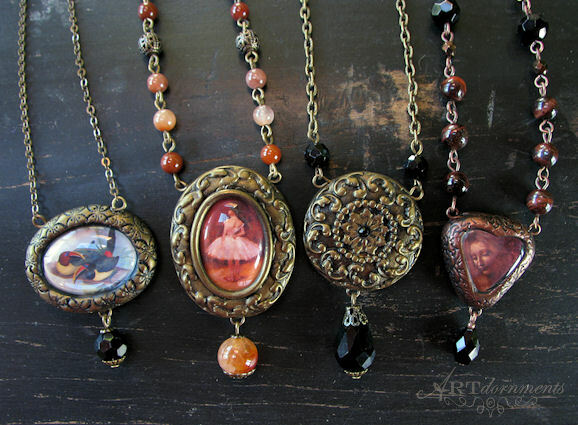 Four new ARTdornments necklaces are on auction this week, ending on Friday. They include a beaded Crow/Raven set, a piece with a Fleur-de-lis design, a piece featuring a lovely lady with an Amazon parrot, and a beaded Senegal set. 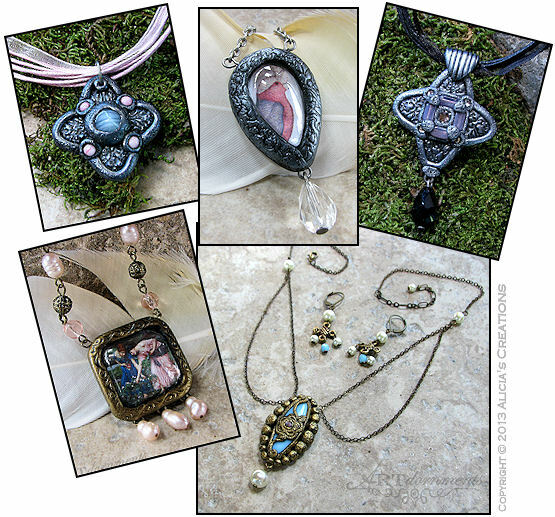 There are a lovely assortment of Artdornments on auction this month, which include necklaces featuring a Greenwing Macaw, a Female Eclectus, a Medieval Lady, a Lapis Lazuli with Pearls pendant, and a medieval styled Medallion with blue glass stones. The necklaces are all being auctioned on eBay for five days, ending on Thursday, June 27, however they could be ended early with Buy It Now - so please place a bid right away if you don't want to see someone else snap them up.